Discussion in 'All Things LitRPG' started by Windfall, Oct 19, 2018. Dunno what they are planning on doing. I just pointed that out. Developing is depend on what u want to do. I didn't read the whole thread. I just read some part so I don't know the purpose of this. Most of the free ones expire early, don't they? Easier to pony up the funds, imho. You can just set an auto-renew. Waste 75$ for an SSL is not really useful. Specially when you can use the 74$ for other stuff. You still have to install it on the server. Depends on what type of site you're building too, really. What free SSL certs do you use? One thing I will note, but Baguetti/Guillotine Western does have a gamified digital realm called the Electronic Afterlife. Would that count as Gamified digital realm? My series overall have different kinds of digital worlds depending on the context. There are ones dead people go to for Digital Reincarnation, while living people play inside Voreth's Promise. Voreth's Promise is a Gamified Artificial Universe (rather than a digital construct) where user have their own worlds build from their own personalized gameplay desires. Dream-Scanners monitor gamers gone rogue. The crux of most of my Romantic Tragedies. I'm thinking some kind of cross-over of Industrial Espionage/GameLit myself. Where Spies gone rogue (ally with the gamers) are publicly beheaded by the Industrial Secret Service. An 'official review' for stories that have more than... 50 reviews? Someone neutral and trusted by the community would need to write these, but it basically says what the story is about, what the main focus of the story is, and the strengths and weaknesses of the story. It's supposed to provide the 'community's standpoint' on each book, pointing out what fans like about the story, and what critics find problematic. Or maybe 'The Panel's Review'? So readers new to the community can go through these neutral reviews to see what the consensus is on 'popular titles' and then go from there. There would need to be some way for me to verify the review itself actually reflects the content being reviewed, before I trusted a review to inform my purchase decisions. I've seen way to many reviews that basically are just "this author knocked me out of the way to they could get to the water fountain first" kind of childishness. Places like goodreads expects people to take them at their word, but that's a great way to lose money: purchase things you don't really want because the author was nice. And that's assuming you can trust that. It be nice to see what would make a review official. For me, I don't care how trustworthy the reviewers are, if they're leaving strings of one or five star review, I'm very likely to take those with a grain of salt. I was talking about the reviews on Paul's eventual be-all-end-all website. Maybe calling it a review isn't right, but an Editing Panel's introduction to popular titles? Something extremely neutral, but still serves as an 'ad' for the story. It's "the community's version of 'the skinny'". Eventually users of the system can pick their own reviewers they trust, and the system will calculate based on their preferences, but this is just to help new readers find their way around the genre before they form their own opinions on what they like. Is there currently tag for a kind of post post post post times infinity Cyberpunk? What I'm thinking of is a kind of medieval fantasy that devolves from a Cyberpunk dystopia about one thousand years ago. The tag system has not yet come into existence, so we've gotta wait and see what we end up with. But in that case I'd say using dual tags of [Cyberpunk] and [Medieval] would do the job? This way, readers looking for cyberpunk and readers looking for medieval flavors will both see your story in the filtered result. 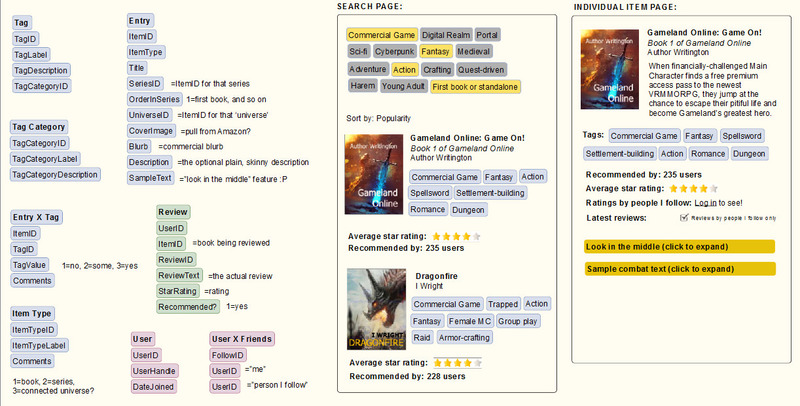 Why not use GreatlitRPG's LitRPG Book Finder Tool for a jumping off point instead of designing something from scratch? I have already implemented many of the things you are trying to accomplish, with the exact same intent as well. I'd be happy to add some moderator accounts, actually, I would love to. Windfall, Paul Bellow and LWFlouisa like this. Yeah, it's going to be a while before I get to it, so I second @Muffassa taking over as lead author/designer! Seriously, though, I'm here to help how I can, but let's get this going. @Windfall ? How's it sound? I really don't mind however it's implemented or who implements it, since I just really want this thing to exist. I know about GreatLitRPG and I like it! But I was concerned about the completely different database structure, and that to suggest this system might be rude, since it's kinda something else from what exists right now. Each 'group' is a table. So if we tie the links this way, we can make it filterable, searchable, and quite scalable I would think. Let me know what you think, though. Hmm I see the problem now. I do think the finder tool can be morphed into what you envision, but it is so large that it might be wiser to just start from scratch. I will think more on this. Either way, sign me up to work on this whenever we figure out a plan! Paul Bellow, Windfall and LWFlouisa like this. Yeah... so I'm not so sure how to go about it. I'm quite certain PHP + MySQL can do the job, but that's a lot of coding! I still say it's a Drupal problem. I just need to make some time for this project.